The next generation of scientific experiments and studies, popularly called as e-Science, is carried out by large collaborations of researchers distributed around the world engaged in analysis of huge collections of data generated by scientific instruments. Grid computing has emerged as an enabler for e-Science as it permits the creation of virtual organizations that bring together communities with common objectives. Within a community, data collections are stored or replicated on distributed resources to enhance storage capability or efficiency of access. In such an environment, scientists need to have the ability to carry out their studies by transparently accessing distributed data and computational resources. 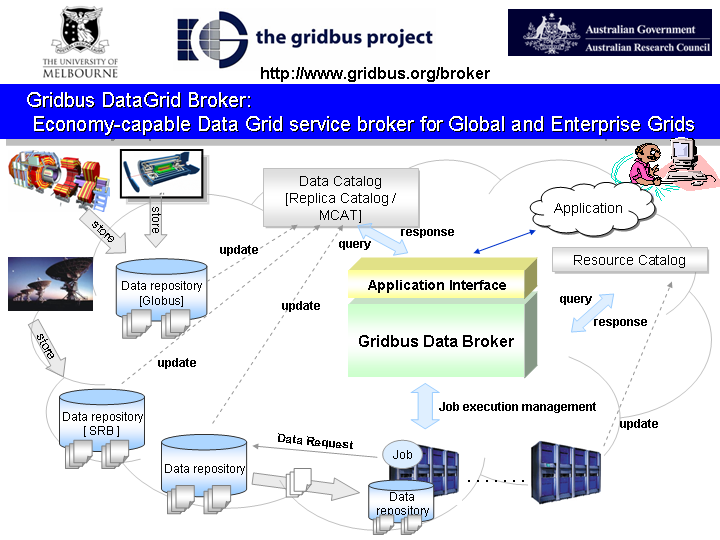 The Grid Service Broker, developed as part of the Gridbus Project, mediates access to distributed resources by (a) discovering suitable data sources for a given analysis scenario, (b) suitable computational resources, (c) optimally mapping analysis jobs to resources, (d) deploying and monitoring job execution on selected resources, (e) accessing data from local or remote data source during job execution and (f) collating and presenting results. With version 3.0 of the Gridbus Broker there is support for Globus toolkit version 4.0.2 and integration within portal environments. Amongst other things, support for the use of multiple brokers within the same VM has been improved. Future releases of the broker will continue this trend towards increased support for portal and other eScience application developers needs. The Gridbus Broker also features a WSRF compliant service, to allow access to most of the features of the broker through a WSRF interface. Plugin structure for middleware and programming models. Ant build file for automatic downloading and configuration of broker installation. Thread programming model plugin (similar to Alchemi Grid Threads). It contains the broker classes, source code, and documentation. Please note that it allows you to schedule your compute and data-intensive applications on resources running Globus, Alchemi , PBS, and SGE. If you would like to become a member of the Gridbus community and wants to extend or make use of it, please let us know. The broker will undergo continuos enhancement and we welcome your participation and encourage you to become a co-author of future versions of the software. The Gridbus broker is distributed under the GNU Lesser General Public License (LGPL). Other libraries included in the distribution are distributed under their own respective licenses which are also included. This product includes software developed by and/or derived from the Globus project (http://www.globus.org/). If we have have left out anyone, please let the Chief Investigator know. Srikumar Venugopal, Rajkumar Buyya and Lyle Winton, A Grid Service Broker for Scheduling e-Science Applications on Global Data Grids, Concurrency and Computation: Practice and Experience, Volume 18, Issue 6, Pages: 685-699, Wiley Press, New York, USA, May 2006. Baden Hughes, Srikumar Venugopal and Rajkumar Buyya, Grid-based Indexing of a Newswire Corpus, Proceedings of the 5th IEEE/ACM International Workshop on Grid Computing (Grid 2004, IEEE CS Press, Los Alamitos, CA, USA), Nov. 8, 2004, Pittsburgh, USA. Marcos Dias de Assuncao, Krishna Nadiminti, Srikumar Venugopal, Tianchi Ma, and Rajkumar Buyya, An Integration of Global and Enterprise Grid Computing: Gridbus Broker and Xgrid Perspective, Proceedings of the 4th International Conference on Grid and Cooperative Computing (GCC 2005, LNCS, Springer-Verlag, Berlin, Germany), Nov. 30-Dec.3, 2005, Beijing, China. Scott Kolbe, Tianchi Ma, Wei Liu, Wee Siong Soh, Rajkumar Buyya and Gary Egan, A Platform for Distributed Analysis of Neuroimaging Data on Global Grids, Proceedings of the 1st IEEE International Conference on e-Science and Grid Computing (e-Science 2005, IEEE CS Press, Los Alamitos, CA, USA), Dec. 5-8, 2005, Melbourne, Australia. Hussein Gibbins, Krishna Nadiminti, Brett Beeson, Rajesh Chhabra, Brian Smith, and Rajkumar Buyya, The Australian BioGrid Portal: Empowering the Molecular Docking Research Community, Proceedings of the 3rd APAC Conference and Exhibition on Advanced Computing, Grid Applications and eResearch (APAC 2005), Sept. 26-30, 2005, Gold Coast, Australia. Rafael Moreno-Vozmediano, Krishna Nadiminti, Srikumar Venugopal, Ana B Alonso-Conde, Hussein Gibbins, and Rajkumar Buyya, Distributed Portfolio and Investment Risk Analysis on Global Grids, Technical Report, GRIDS-TR-2005-14, Grid Computing and Distributed Systems Laboratory, The University of Melbourne, Australia, Nov. 14, 2005. Krishna Nadiminti, Srikumar Venugopal, Hussein Gibbins, Tianchi Ma and Rajkumar Buyya, The Gridbus Grid Service Broker and Scheduler (2.4.4) User Guide, Technical Report, GRIDS-TR-2005-15, Grid Computing and Distributed Systems Laboratory, University of Melbourne, Australia, May 30, 2006. Srikumar Venugopal and Rajkumar Buyya, A Deadline and Budget Constrained Scheduling Algorithm for eScience Applications on Data Grids, 6th International Conference on Algorithms and Architectures for Parallel Processing, Oct. 2-5, 2005, Melbourne, Australia.